Right, lets not beat about the bush. Let’s kick it off with the only real question; should you buy one? You shouldn’t buy one of you’re convinced that disc brakes aren’t worth it, you’re addicted to Belgian style brands with unpronouncable names, or want something that will transmit EVERY SINGLE TINY VIBRATION directly to your arse (some people like that in a race frame). Mine turned up just over a month ago, all wrapped up, unbuilt in a big, obvious box that was quite hard to get i the back of the car to take home from work, where I had it delivered. I’ve put lots of bikes together before now so assembling it wasn’t too onerous a task. It’s mixture of “you’ve not really got a choice” Avid BB7 brakes and “lets be sensible” SRAM rival groupset (with an FSA gossamer 36/46t chainset) all slotted into position without much faff. It’s got one of those widgets so the bottom swing front mech works with the cable routing (which runs along the top tube…like it should on a bike that’s going to be ridden in the mud). I don’t really like them, they just turn into a nice mud shelf and the tight turn the cable has to do means more maintenance and cleaning is needed to keep everything shifting smoothly, but it’s needed for the SRAM mech, so tough! It was all stuck together in a couple of hours (once I’d located some spare brake cable outer, as the amount supplied with the STIs wasn’t enough to run all the way from the rear caliper, along the cable route up the downtube and to the shifter/brake lever, luckily the need to add a barrel adjuster somewhere before the first cable guide on the frame means adding the extra bit isn’t too much of a hassle) and once I’d bolted some rotors onto a space pair of 29er wheels it was ready to roll. First impressions were, you won’t be shocked to learn, good. Coming off several (happy) years riding an Uncle John I expected the dirty disco to feel very similar. The ‘large’ sized frame, with 100mm stem seemed to fit my bog standard 5ft 11ins bodily proportions nicely, without having to jam the saddle as far forward/back as it would go, or using thousands of headset spacers to get the bars somewhere reachable. Over the rough packhorse trails, rocks and gritstone that the trails ’round these parts’ are made from the carbon muted the buzz and vibrations coming up from the wheels nicely. Less flex and twist from the rear end, partly due to the shorter chainstays partly due to everything being ‘bigger, chunkier’ etc meant staying on line was easier while the nice stiff bottom bracket (which looks huge when you’re building the bike) meant stamping on the pedals never felt vague. The Gossamer cranks work well to compliment this, OK there are stiffer cranks out there but for the price they’re great…certainly good enough to put a cross through any “couldn’t get the power down” excuses you might have been planning! A rather nervous first ride or two as I got used to riding off road on a cyclocross bike again (in fact, riding off road at all, after giving up slopping round muddy trails in favour of more road based stuff for months) didn’t throw up too many surprises. Yes, it was easier to keep on line than the Uncle John, yes it felt a bit stiffer and more responsive under hard pedalling but it hadn’t fired me off into the undergrowth at any point with some new handling quirk. It wasn’t until I started getting pinch puncture after pinch puncture that I realised I’d started riding it like a 29er, after just a few hours on it. The handling was faster, as you’d expect and, if I buggered up a route over rocks/roots I’d know about it (or just puncture, again!) but the cost in innertubes and repair kits seemed small fry in comparison to pushing the limits of what I could get away with each time the trail pointed down. What you might be surprised to know is that I don’t attribute much of that to one of the big selling points of the bike – the brakes. 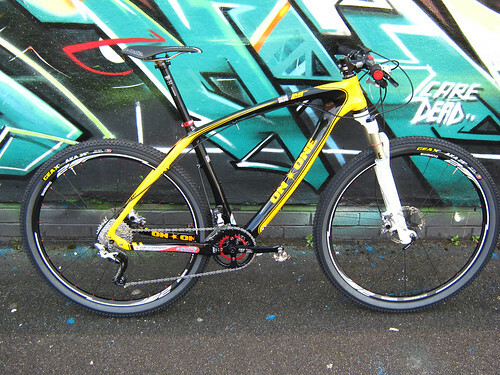 I sort of knew from the outset that the cable discs wouldn’t offer up anything like the power or control on tap from the XT ones on the Lurcher but for the first few rides I wasn’t even sure they were matching the Tektro Oryx cantis I’d been using on the Uncle John. Last time I raced the 3 Peaks I had no issue braking (with the Oryxs) using only one finger and had no lack of stopping power hurtling (artistic license, OK?!) down Pen-y-Ghent. Skipping down from Darwen Tower on the Dirty Disco I was hauling on the levers for all I was worth with two fingers, feeling all the pressure I was applying disappear as the outer cable just compressed and contorted. I wasn’t impressed. I was even less impressed when I discovered the stock pads had worn down to the backing plates within a week. The whole “discs need less faffing to get set up right” plus point avengalists seem to spout repeatedly went out of the window as I hunted down some better pads and spent lots of time researching the best way to get the calipers/cables set up before finally finding a set up that offered enough power to be a worthwhile ‘upgrade’ over a canti braked bike. There’s no less faff in setting the calipers up, you still have to manually adjust the brakes as the pads wear down and they will still get covered in mud and make horrible scraping sounds as soon as you ride in the wet, just like your rim brakes do. They can, however, offer more power, once you’ve finally found the set up sweet spot. They won’t wear your rims out either, which is nice. Oh and if you get carried away flying round your local trails and knock your wheel out of true, provided it still fits through the frame/fork your’ brakes will be fine. Hooray! After a few short rides that didn’t leave me feeling beaten up I decided to start using the bike for longer, more adventurous riding. All day rides that took in everything from twisting, winding country roads, over broken, semi forgotten byways and greenlanes, across endless feeling moors right through to bridleways that, if popular mountainbiking magazines are to be believed, really require a full suss. This, for me, is where it excelled. Built up as it is in the pics, it weighed somewhere around the 20lb mark, not losing out by too much to many road bikes and with the tyres pumped right up, rolled quick enough to keep up with quite a few (somewhat confused) Sunday roadies. It didn’t feel like a slog on the tarmac. Once back off road, that almost mtb like confidence that appeared on the first rides meant that I was back pushing myself to go faster on the tricky bits rather than just creeping and picking my way over anything technical. I flew round a few big rides, each time adding more distance and off road to the route to see just how far I could ride and for how long before getting to that point where the bike simply wasn’t a nice place to be anymore. The longest I managed was 10 and a half hours, after which point I gave up trying, as that point simply wasn’t coming! The Dirty Disco is made for epics. 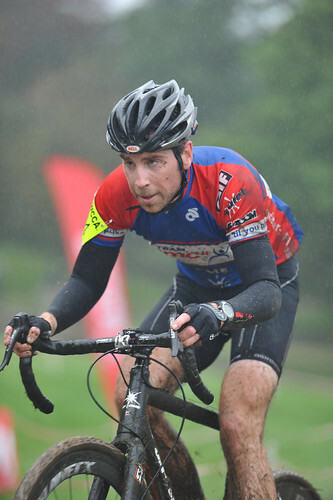 Of course, cyclocross bikes aren’t often bought for their ability to do day long, monster length rides. Most people see cyclocross as something to do for an hour each week in a race. Flat out as fast as you can, actively seeking a new max heart rate in a local park while chasing down anyone in front of you in a race. All my dawn till dusk rides on it may have been fun, but I knew a ‘cross bike is never fully tested until you’ve raced it, so last Sunday I found myself stood on the start line of the first round of the NWCCA league, wondering how much of an effect the lack of intervals and sprint raining was about to have on my performance, while simultaneously panicking about whether my freshly glued on tubular tyres would stay put on the lovely carbon Planet X rims. The gun went off and, from my position at the back of the field I set about testing the limits of the bike, working my way past racer after racer as my confidence in my glueing ability grew. The handling of the bike came into it’s own on the seemingly endless sweeping, then tighter corners. Lots of overtaking round the inside of riders sliding wide on the greasy surface ensued! Rather than fire you off every time you slithered on the off camber, piss wet through grass, the bike seemed to hold it’s line really nicely – it worked with you, in fact at points I was imagining it looking up at me and saying “OK, you’re no Sven Nys, but lets work with what we’ve got, eh?” which was both reassuring and utterly galling all at the same time! The light weight meant that getting up to speed was dealt with quickly and shouldering the bike wasn’t too uncomfortable. No canti brakes meant there was less for the churned up mud and grass to gather round and, despite only have the one bike, I never got near clogging the frame up. My lowly 30th (out of 125) place was entirely my fault. I rolled over the finish line in no doubt that the bike wans’t anywhere near it’s limits with me in charge…a fact underlined by Dave Haygarth using his ‘DD’ to get right up in the top ten, in amongst the ‘fast boys’. – Use the PLanet X tubular disc wheels more, as they appear to be ace! Well yes, you’re right, they do. Quite a departure for me I’ll admit, but seeing as quite a few race organisers have got their acts together over the past couple of years and have started putting decent courses for endurance races together, combined with the ever increasing Daftness of the Daft Rides we JMC types have been creating (stay tuned, there’s a couple of absolute belters coming up!) means I thought I’d give suspension a go. Everything else is pretty similar to what I’m used to/like already; the Lurcher frame has the same angles as the aluminium ScandAl, which is ace and the finishing kit, while being rather blingy, isn’t overly radical in size or shape and everything falls to hand naturally. Lap 2: Pit stop to tighten rear cassette that had come loose. 2 mins. Lap 6: Pit stop to relube chain and fit lights to bars (not dark so didn’t bother with helmet light…). 2mins. Lap 9: Pit stop to check whether last lap had to be completed by 12am or started by 12am. 3 mins. Lap 4: World’s longest ever trackside pee stop! Lap 10: Ease back & guzzle a couple of caffeinated gels in case Matt Page catches up & it all ends in a fast last lap! 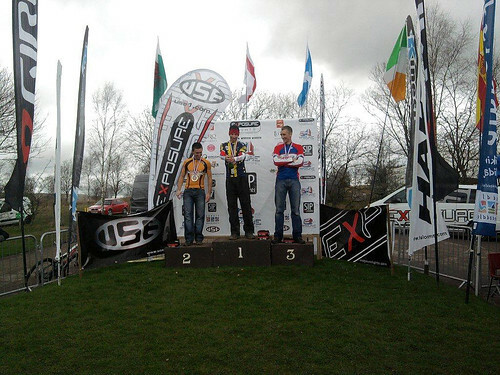 2nd place at strathpuffer 2009. Not a bad result, feels a bit galling as i lost what feels like loads of time with mechanicals (lights conking out part way through a lap, punctures, exploding gas cartridges and the like). Would proably have dropped out if angela hadn’t been there every lap (ie 26 times) waving cups of tea and anything else i felt like I’d need at me. Didn’t kill as many brake pads as I expected – think it was about 3 pairs and the ice tyres i bought specialy still haven’t been used, which just goes to show how unpredicable the race is. Shaggy won, nearly lapping me by the end, Alex Slavin came 3rd (he beat me in 2007), Kate came 3rd in the womens cat IIRC, Angela became known as “bag lady” in the registration tent due to her tirelessly running round for me carrying bags of, well, anything i wanted really and I think everyone had a laugh and a proper “experience”. We took the scenic route home round loch ness and over the highlands, it was awesome. Seriously impressive stuff with the recent snow just adding to the remoteness of it all. The new tent is huge, I can stand up straight even in the lowest corners and you could quite easily lose someone in there. the phrase “maybe even Too Big” was uttered (but quickly forgotten). The car did brake down on the way there, but was fixed by another nice AA man simply by pressing a big red button under the bonnet, after which it’s been fine (and even quite sure footed down the icey highland roads). can you tell what it is yet?! The joy that is web-based route planners all agree on the quickest route to the strathpuffer, however there seems to be some discrepancy between them on how long it should take: the shortest time being 5hrs 37mins and the longest currently standing at 7hrs 14mins. I’m planning on it taking all day as I’m quite tempted to stop off and do some tourism en route – the dalwhinnie distillery is temptingly close to the A9. As you can see, the new tent is hugely huge – and this is before it gets removed from it’s carry bags (and we all know that tents never fit back in their carry bags properly once you’ve dared to remove them…). Oh and no, I’ve not cleaned the Uncle John since the race on sunday, I know I should, but it’s cold outside.